Joel Babb, the owner of Kings Meat, childhood was spent on family farms in Southeast South Dakota. Back in those days the farm was self-sufficient and organic. About 20 years ago, Joel moved to Russia. Joel won Kings Meat Company in a poker game when the former owner went ‘all in’ and lost (most of that prior statement is true). The company has been in existence for over 12 years. All products sold meet the highest world standards, where the focus is on quality rather than quantity. 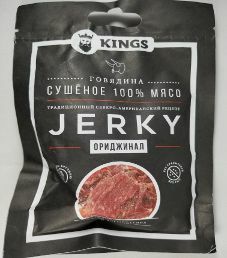 In 2016, Kings Meat Company launched their Kings Meat jerky brand, which is advertised as using whole cuts of choice beef, and marinated in a special sauce with natural spices. Kings Meat jerky strips are suspended from hooks, and carefully dried at a precise temperature. This hanging process keeps the moisture/juice/flavor in the beef, as opposed to drying jerky strips flat on a tray. 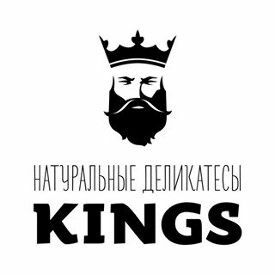 Kings Meat is distributed by Kings Meat Company, and it is located within Moscow city limits, also known as the Russian oblast of Moscow Oblast, Russia. The next review for Kings Meat will focus on a 1.267 ounce/36 gram bag of their original flavored beef jerky. We previously reviewed this original flavor, where the facility of where this jerky is manufactured has since changed. Joel teamed up with two new local partners who are experts in retail and distribution. One of the stickers on the bag also changed because Russia adapted a tracking system in July 2018 for all foods, tracing the inputs from producer to end consumer. This original flavor is described as having a classic taste with health benefits, and it is perfectly suited as an appetizer for a a dry red wine and craft beer. The jerky bag was graciously submitted for review by the owner, Joel Babb. Ingredients: Beef, Spices, Spice Extracts, E-300 (Ascorbic Acid), E-551 (Silicon Dioxide), Sugar, Salt, Himalayan Pink Salt, Sodium Nitrite. The Russian black angus beef used here is sourced from Prime Beef, and is arguably even healthier than 100% grass-fed beef. Cattle are raised in the ecologically clean and fertile Kaluga and Voronezh regions. The cattle are fed a diet of grass and hay for most of their lives, and finished with non-GMO corn. To get more details, visit http://primebeef.ru/en. The beef used is guaranteed to be ethically raised, meaning free of growth hormones or additional antibiotics. These cattle also are guaranteed to have at least partial free range access to roam about. As a result, the ingredient rating starts at an Excellent (10/10) rating. Healthy spices and spice extractives are used, which may include paprika, garlic powder, and onion powder. A nutrition facts table is displayed on the bag, but the sugar and salt levels seem to be measured differently in Russia compared to North America. Judging on the saltiness and sweetness tastes alone, both the sugar and salt levels are within reason. 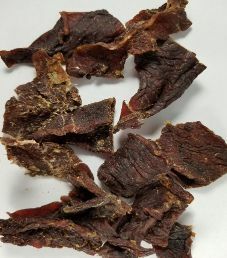 This jerky does not qualify to have no sodium nitrite, where sodium nitrite is used outright as a preservative to lose a rating. Commendably, there is no MSG added. These strips of jerky are small in size, and sliced thin. The texture is fairly dry, which does require a somewhat fair amount of effort to chew. The aroma is overwhelmingly strong of a unique fragrance of beef compared to North American beef. It is challenging to describe this foreign aroma, where buttered popcorn is the best description that we can come up with. Immediately you are greeted with that same strong buttery popcorn type of beef flavor, similar to what you would eat at a movie theater, but better tasting. We are informed that the Russian raised cattle used were grass-fed most of their life, and then finished with non-GMO corn. This results in a rich, flavorful tasting beef that grows on you, and an improvement compared to North American beef, but takes some time getting used to. 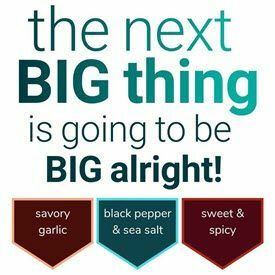 Other flavors that start to take notice are a mild level of saltiness, light black pepper, light garlic, and a faint level of onion. The saltiness for sure is the most noticeable flavor regarding spices, but by far and away the most dominant flavor here is this Russian bred beef at Prime Beef. There is little sweetness present, which helps explain a bit how the flavor of beef here is so powerful tasting. The natural beef flavor is supposed to be the most prominent flavor in an Original flavor, and this is no doubt the case here. While the overall flavor profile is not bold or complex tasting with a light seasoning used, this flavor is pleasant tasting, and addictive for beef aficionados. Paul and Stephane were at an 8 taste rating, but the superior tasting beef used here pushes this flavor to a 9 taste rating. As advertised, this jerky would be best accompanied with red wine or craft beer. A 1.267 ounce/36 gram bag sells for around 200-250 rubles, which is converted to approximately $3.50-$4.00. That works out to $2.75 an ounce, which rates as an average price. This resealable plastic bag has everything imprinted directly on the bag, both on the front and back. 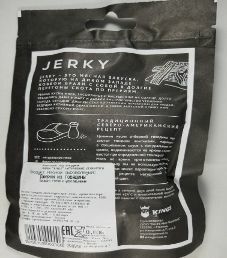 A high resolution picture of jerky strips is displayed on the front. Cleverly, the jerky itself is packaged inside a vacuum sealed hidden bag, the best way to keep jerky fresh tasting. Some facts printed on this bag are “Beef-Dried 100% Meat”, “Traditional North American Recipe”, “Handmade Without Any GMO or Dyes”, “100% Natural Meat”, “Source of Protein and Energy”, “Rich Protein”, “Low Fat Content”, “Without Dyes”, and “Ready To Eat”. The only bag category missing is that there is no transparent window to view the actual jerky. There are some blurbs printed on the back that describe Kings Meat jerky. Their @kingsmeat.ru Facebook handle is provided.